 The call for participants of this CEPOL’s flagship activity has just been opened. Interested Law Enforcement officials can contact their National Exchange Coordinators through their CEPOL National Units (list of contacts available here). This Erasmus-style exchange programme run by CEPOL since 2007, allows law enforcement officers to spend one week with a counterpart in their country, exchanging knowledge and good practices, initiating cooperation projects and fostering deep and long-lasting learning and networking opportunities. It is an excellent opportunity to improve your knowledge and to open new horizons in the way of investigating. A totally practical approach to other law enforcement and the best way to increase your professional network. 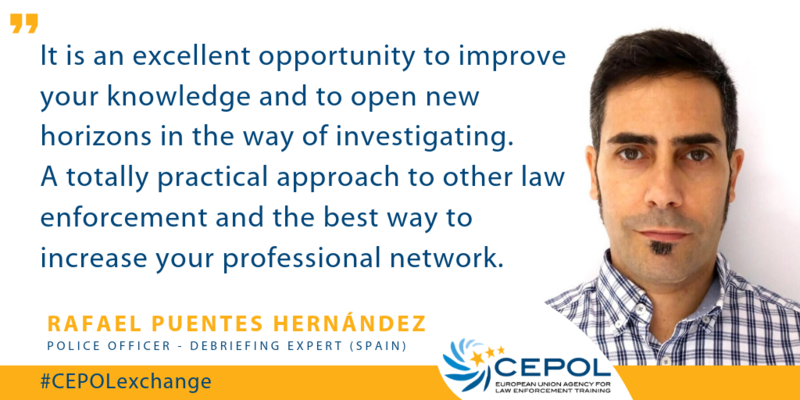 (…) We cannot forget also its human dimension, to meet different cultures, to better understand them in both dimensions: on a professional and a personal level – underlines Rafael Puentes Hernández, Police Officer - Debriefing Expert from Malaga, Spain and participant of CEPOL’s flagship exchange programme (June 2017, in France). 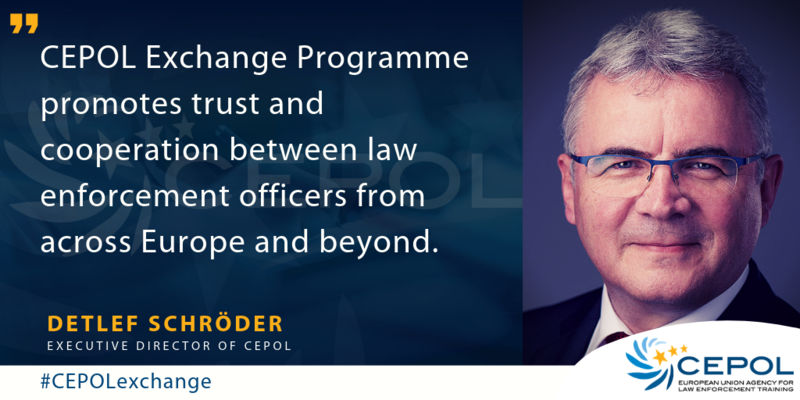 The programme seeks to enhance cooperation in combating crime – explains Detlef Schröder, CEPOL’s Executive Director - it is based on mobility, mutual learning and provides participants with an opportunity to familiarise themselves with working methods of other countries. Such exchanges promote trust and cooperation between law enforcement officers from across Europe and beyond. The programme fulfils one of CEPOL’s key objectives - developing a European law enforcement culture. It allows participants to spend a week (Monday - Friday) with a counterpart in a chosen hosting country. It is open to law enforcement officers from all EU Member States, EU Candidate Countries, Western Balkan and European Neighbourhood Policy Eastern Partnership countries. The principle of the Exchange Programme is that the exchange should be done on a bilateral basis. Each sending country also functions as a hosting country, i.e. each exchangee goes to one and is also expected to host the colleague from the country s/he visited. Each exchange is organised around one specific topic. commit to cascading their newly gained knowledge to colleagues at a national and European level. And join our dedicated WEBINAR on the CEPOL Exchange Programme 2019 here.